When I started my farm business, years ago, I studied everything I could find about the agricultural techniques of Native American Indians. Our South Texas Indian ancestors were expert farmers. They successfully cultivated our harsh and unforgiving land, and made their living on it. I knew they could teach us a great deal about how to plant a modern garden. Our part of the country–the sandy strip of land along the Gulf Coast from Victoria to the south of Corpus Christi–is one of the toughest places in America to farm. I wanted to know how the local Indians, with nothing more than simple stone tools, thrived on this land. The best information I found about South Texas Indians came from a Spanish Conquistador by the name of Cabeza de Vaca. Cabeza de Vaca was a great explorer in an age of adventure. He set sail from Spain with a dream to colonize Florida, but after series of mishaps, he was shipwrecked on Galveston Island. The year was 1528, and Cabeza de Vaca was the first European to set foot in Texas. The local Indians rescued him from the windswept waves and kept him as a slave. But Cabeza de Vaca used his ingenuity to escape to the mainland. He vowed to somehow find his way to Mexico City–the closest Spanish settlement at that time—a 700 mile hike through a beautiful and treacherous landscape. 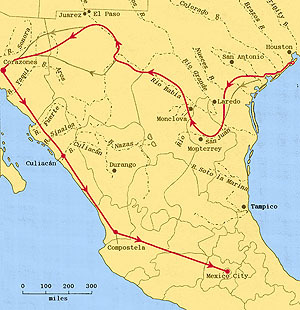 Cabeza de Vaca traveled south along the Gulf Coast, trekking through the future cities of Victoria, Corpus Christi, and down through the Rio Grande Valley. He crossed the Rio Grande, turned west, and then this remarkable explorer walked all the way to the future site of El Paso, then on to the Pacific Ocean, and finally down to Mexico City. He began this eight-year odyssey as a slave, but along the way he became a powerful shaman, and soon the Indians of Texas and Mexico worshiped him as a god, The Child of the Sun. When he reached salvation in the Spanish settlements, he had an entourage of nearly three thousand Indians following along behind him. The land he discovered was densely populated–before disease and warfare decimated the Indian tribes. Cabeza de Vaca describes how at one point he walked for hundreds of miles through beautifully cultivated farmland. In other areas, the natives lived on the brink of starvation with only their genius for procuring food from the thorny earth to sustain them. Cabeza de Vaca wrote about his adventures in extraordinary detail. He told precisely how the Indians of South Texas farmed and foraged, hunted and fished, and how they cooked their hard-earned harvest. I used many of these methods in the design of my farm. In future posts, I will follow Cabeza de Vaca on his journey and learn what he discovered about indigenous South Texas farming. I will unravel these ancient techniques, and hopefully you can use them to help make your own garden more robust, more productive, more interesting, and more delicious. I look forward to the gardening tips and instructions as well as the history of early Texas farming. Thank you for your research and experience and the wonderful way you make it all interesting. Looking forward to what you’ve found re early S Texas farming. Except for Caddos in E Texas who were certainly agricultural, I thought that the mostly nomadic Native Texans primarily foraged (pecans, prickly pear, persimmons, etc), fished, and hunted rather than farmed. Yes, the conquistadors have a bad reputation, but Cabeza de Vaca was a very interesting case. When he got back to civilization in Mexico City, after his eight years of travel through Texas and Mexico, he was celebrated as a great hero, and the king of Spain appointed him governor of a new colony in Argentina. As Governor, Cabeza de Vaca enraged his Spanish colonists by insisting that local Indians be respected and granted civil rights. He would not allow their enslavement or exploitation, as was happening in all the other Spanish colonies. He fiercely protected the Indians. The Spanish colonists were so infuriated with Cabeza de Vaca that they arrested him on trumped up charges and sent him back to Spain in chains. He died in poverty back in Spain because he fought so hard to protect the Indians under his care. What an interesting end for this great adventurer!